The 2.5 Gal. Amerex water mist fire extinguisher is the preferred choice for Class A fires where a potential Class C (electrical) hazard exists. The fine spray emitted from the unique misting nozzle provides the user protection from electrical shock, greatly enhances the cooling and soaking characteristics of the de-ionized water, plus reduces scattering of burning materials. 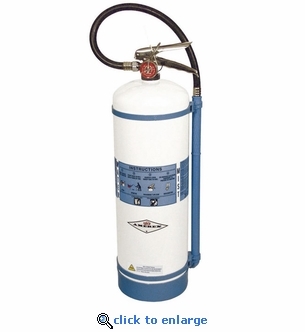 Amerex Water Mist extinguishers are easy to use, maintain and service. Extinguishers are not shipped filled. Filling and charging requires the use of a nitrogen pressurizing source set at no more than 125 PSI. The Fill Adapter is required for the refilling process and replaces the wand during the process. This adapter will be needed by most professionals to handle the refilling process. Contact a local fire extinguisher service company in your area.